Ship specifications varied wildly from ship to ship. See links below for more information. See links below for ship information from World Aircraft Carriers List: RN Light Fleet Carriers and the Canadian postwar fleet. French ARROMANCHES 1946. Paid off 1974. Scrapped 1978. HMAS VENGEANCE 1952. Brazilian MINAS GERAIS 1956. Paid off 2001. Dutch KAREL DOORMAN 1948. Argentine VEINTICINCO DE MAYO 1969. Paid off 1985 / 1997. Scrapped 1999. Paid off 1956. Scrapped 1961. Paid off 1957. Scrapped 1962.
ex-EDGAR. Paid off 1954. Scrapped 1958. Paid off 1956. Scrapped 1962. Paid off 1975. 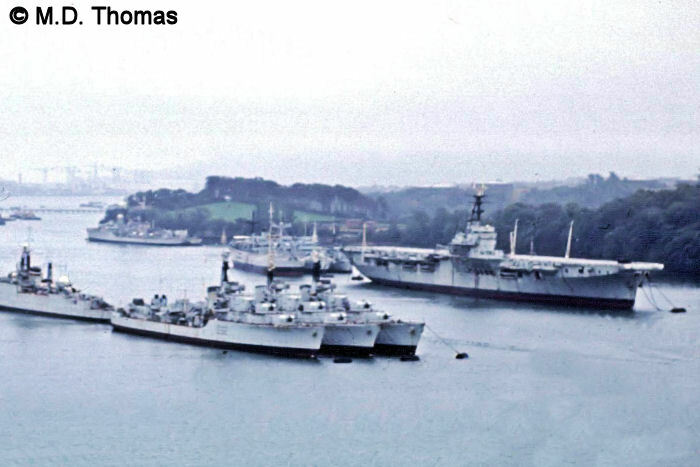 Scrapped after 1981. HMCS WARRIOR 1946-1948. Argentine INDEPENDENCIA 1958. Paid off 1970. Scrapped after 1971. HMCS MAGNIFICENT 1948. Paid off RCN 1957. Scrapped after 1965. HMAS SYDNEY 1958. Paid off 1973. Scrapped after 1975. HMAS MELBOURNE 1955. Paid off 1982. Scrapped after 1994. HMCS BONAVENTURE 1957. Paid off 1970. Scrapped 1971. 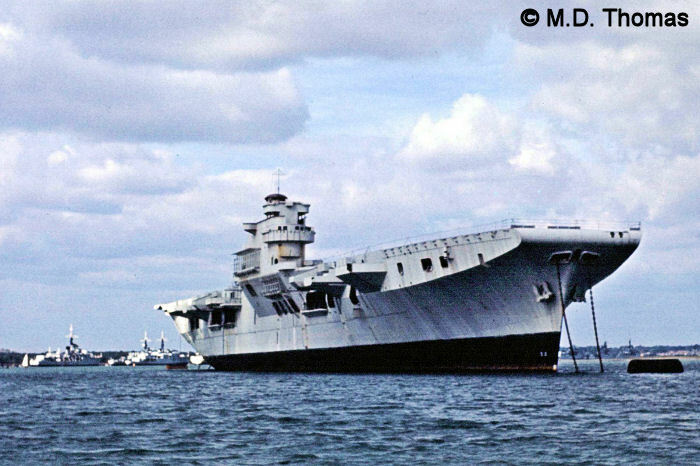 INS VIKRANT 1961. Paid off 1997. Museum in Bombay / Mumbai. Donated turbines and boilers to ex-VENERABLE. 1. MAGNIFICENT is laid up upon her return from the RCN. M.D. Thomas Photo. 1. LEVIATHAN laid up. M.D. Thomas Photo.